The original Charlton Heston "Apes" is a film I mostly relegate to childhood memory when I would always seem to catch bits and pieces of it on TV. I never really looked into or realized the subtexts of the story until after Tim Burtons 2001 re-imagining appeared on screen. I have never seen the other films in the original series, but I went into "Rise of the Planet of the Apes" knowing where this all was heading and that is all you really need seeing as this is an origin story. That is part of the intrigue of this project as well, an engaging film has already given us a world audiences are interested in, to see the revolution that led to our roles being switched and how humanity was reduced to nothing more than wild animals ourselves seems, if not only a scheme to make more money off the franchise, at least a credible way to re-boot it. 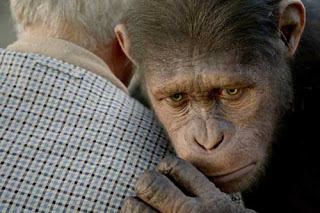 The film has been stacked with A-list actors and top of the line special effects that help create a performance by Andy (Gollum) Serkis as our star ape, Caesar, one of the most memorable and moving performances of the summer. It is a cautionary tale of human ignorance or should I say arrogance and the desire to know more even in the wake of danger. "Rise of the Planet of the Apes" doesn't have to give us a reflection of our species as the apes, here, we see our own undoing. It is easy to say this is one of the best "summer movies" this year, and it is, there is no ignoring the fact it has all the elements a big summer action flick should contain but this is also a very layered story. It gives us the progress of Caesar growing and learning at a pace that makes us completely believe the fact this ape could become what is essentially a human. Caesar is a real character, he is not simply a creation of CGI that is to be marveled at for his seamless integration into the real world but for the accomplishment of his emotional arc being expressed through the motion capture technology. What Serkis brings here is that layered performance that allows us to believe in Caesar and why he is led to do what he does. Truly, Caesar is the entire reason this film succeeds. While we also have the always interesting James Franco playing a young scientist working on a cure for Alzheimer's and "Slumdog Millionaire" alum Frida Pinto as his love interest, both of which have more screen time than John Lithgow but don't create near the impact. Pinto is mainly relegated to stale leading lady and is almost unnecessary if not for the brief moments when she is the voice of reason to Franco's blind drive. Franco on the other hand is not what you would call "in his element" here but it makes sense and his interaction with Caesar does nothing but to build the credibility of the lead ape and to make the eventual revolution he creates all the more heartbreaking. About that revolution, many will say the film devolves into the exact kind of movie it had rose above this summer, but the scenes of hordes of apes breaking their brothers out from zoos and causing chaos on the streets of San Francisco has been built up to so fantastically that this doesn't classify as mindless action. These actions and their deep-seated emotional ties give us sweeping portraits of these animals swinging through suburbia and under the Golden Gate bridge as they poke holes in the human race's belief we are invincible. The entire scenario gives into just how vulnerable we are and just how easily we could be over-run. The "Ape" films have always seemed to have bigger ideas in mind and though this latest addition doesn't aspire to be as much we do see hints of where this is going and what this "could" all lead to. While here we are simply witnessing the rise of an underclass it is the fact we as an audience identify with them and empathize with those that are rising against us is the real accomplishment. There is a pivotal scene after Caesar is placed in a primate sanctuary that is more prison-like than safe haven when Caesar has begun to rally his fellow primates and they are, for the final time, tried to be put in their place by a human. It is the moment we realize the extent of just how far Caesar's intelligence has come and in the theater I watched the film their was clearly a strong reaction to the moment, it wasn't one you had to cover a laugh at with either, this was genuine unbelievability and it set the tone perfectly for the final act of the film. The apes make their presence known. 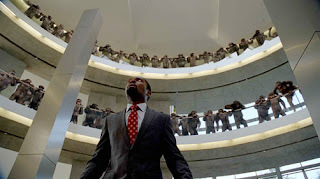 I went into "Rise of the Planet of the Apes" with modest expectations and left in honest surprise at how much I enjoyed the film. Not only did it offer an intelligent and engaging story but it is elevated so far by Serkis's one man show and the perfect tone set by director Rupert Wyatt, not to mention the beautiful cinematography by Andrew Lesnie. 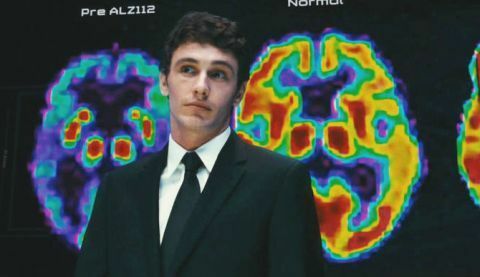 As said earlier, it is the inner conflict with Caesar that drives him to wreak the chaos at the climax of the film and to experience that fully engrossed causes the nearly two-hour film to fly by. 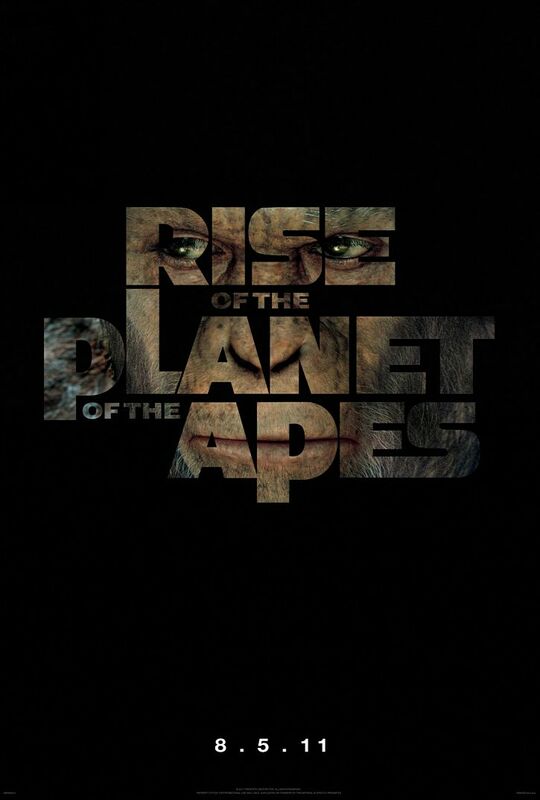 This is a fun experience, an entertaining ride that is engaging to the point that even Brian Cox shows up in a small role that was completely unnecessary for him to play, but he only adds to the thought that being a part of an "Apes" movie is somewhat inspiring. I can't go without mentioning Tom Felton shows up here as some off version of Draco Malfoy as well, but c'mon dude you've played that gig for ten years, let's try something different. 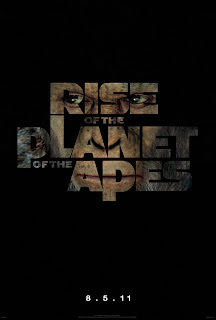 It might be the fact I didn't expect this to be as fascinating and engrossing as it turned out to be but I truly enjoyed "Rise of the Planet of the Apes" and can say without a doubt and with all that has been previously stated that this certainly is one of the best summer movies of 2011.